Hunt, who had been the health secretary, is considered one of May’s most loyal ministers. May’s government was rocked Monday by the resignations of Johnson and Brexit Secretary David Davis. They quit amid divisions in the government over Brexit. Johnson and Davis advocate a clean break with the European Union, known as “hard Brexit.” Hunt, who backed the “remain” side in Britain’s 2016 EU membership referendum, favors keeping close economic ties to the bloc after the U.K. leaves next year. 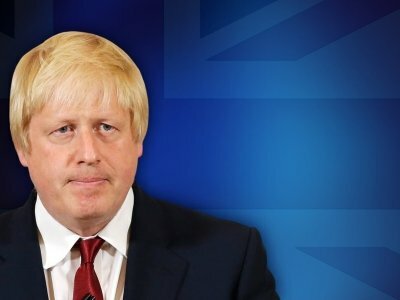 Now-former British Foreign Secretary Boris Johnson has slammed Prime Minister Theresa May in a resignation letter, accusing her of flying “white flags” of surrender in negotiations with the European Union. Johnson, one of the most vocal and popular proponents of Britain’s exit from the European Union, quit as Britain’s top diplomat on Monday. His move came hours after Brexit Secretary David Davis also resigned, blowing open divisions over how to leave the EU that threaten to topple May’s government. Johnson said in his letter that May’s plan to keep close economic ties with the bloc means the U.K. is heading for a “semi-Brexit” that would leave Britain with the “status of colony” within the EU. May’s supporters worry that more ministers could resign, and pro-Brexit lawmakers from her Conservative Party could trigger a no-confidence vote in the prime minister. The White House says President Donald Trump “continues to look forward to” his meeting with British Prime Minister Theresa May this week despite the turmoil that Brexit is creating in her government. May defended her plan for Britain’s exit from the European Union after British Foreign Secretary Boris Johnson and Brexit Secretary David Davis both resigned. Trump will make his maiden voyage to the U.K. as president following a NATO summit in Brussels and before heading to Helsinki for a summit with Russia’s Vladimir Putin. Prime Minister Theresa May has defended her post-Brexit trade plan that sparked Cabinet resignations, saying it is the only way to avoid a hard border with Ireland. May told the House of Commons on Monday that her program — which would allow the free movement of goods, but not services — is the “right Brexit ” because it would make it possible to avoid checks at the border between the republic and Northern Ireland. Northern Ireland is part of the U.K. Lawmakers howled as a beleaguered May paid tribute to two senior members of her Cabinet who resigned rather than accept her proposals. Prime Minister Theresa May has paid tribute to two key Cabinet ministers who resigned rather than accept her plan for Britain’s departure from the European Union. May told the House of Commons on Monday that Brexit Secretary David Davis and Foreign Secretary Boris Johnson made important contributions to Britain, but did not agree with her about “the best way” of delivering Brexit. She said: “We do not agree about the best way of delivering our shared commitment to honoring the result of the referendum” voters approved to leave the EU. Davis resigned as Brexit secretary late Sunday, saying he could not support proposals to maintain close trade and regulatory ties with the EU. Johnson resigned Monday only moments before May spoke. Top European Union officials say Brexit is becoming a mess for Europe following the resignations of the U.K.’s chief Brexit negotiator and foreign secretary. Britain’s Brexit secretary, David Davis quit late Sunday and Foreign Secretary Boris Johnson submitted his resignation on Monday. Juncker’s remarks were a reference to a 12-hour British Cabinet meeting at Prime Minister Theresa May’s country residence on Friday that was supposed to have resolved internal disagreement over Brexit. British Foreign Secretary Boris Johnson has not arrived at an international meeting in London, fueling speculation that he plans to resign over differences with Prime Minister Theresa May on Brexit. Johnson is scheduled to hold a news conference at the summit later. A leader of the campaign to take Britain out of the European Union, Johnson is under pressure to act after the resignation of David Davis as Brexit secretary. British Prime Minister Theresa May’s office insists the government’s plans for leaving the European Union are on track despite the resignation of the top official in the Brexit department. David Davis resigned as Brexit secretary late Sunday, saying he couldn’t support proposals to maintain close trade and regulatory ties with the EU. Davis was replaced Monday with Dominic Raab, a lawmaker who strongly supports Britain’s EU exit. Davis’s resignation shattered a fragile peace in May’s government, which is split between supporters of “hard” and “soft” Brexit. Britain is due to leave the EU in March. The European Union says it will push on with Brexit talks despite the resignation of Britain’s chief negotiator, and is ready to work with his replacement. He said EU negotiators stand ready to work through the summer if needed to reach an agreement. Britain officially leaves the EU at midnight on March 29 next year. The German government says it’s confident the British government can continue to act on Brexit despite the resignation of the minister tasked with the job of negotiating with the European Union. Foreign Ministry spokesman Rainer Breul said Monday that while Germany doesn’t generally comment on foreign Cabinet reshuffles, “we have no doubt the British side remains capable of acting” on Brexit. Britain’s Brexit minister, David Davis, quit late Sunday, two days after Prime Minister Theresa May announced she had united her quarrelsome government behind a plan for a divorce deal with the EU. Separately, German government spokeswoman Martina Fietz downplayed talk of discord on Brexit between Chancellor Angela Merkel and her top security official. Interior Minister Horst Seehofer had warned last week of security risks when Britain leaves the EU. Britain’s government has named former Housing Minister Dominic Raab to take up the post of senior official in charge of negotiating the country’s exit from the European Union, after his predecessor resigned. Prime Minister Theresa May’s office announced the appointment in a Monday statement. Raab, a Brexit supporter, follows David Davis, who had accused May of undermining Brexit with her plan to keep close trade ties with the bloc. Davis quit just two days after May announced she had finally united her quarrelsome government behind a plan for a divorce deal with the EU. The European Parliament’s chief Brexit official is urging Britain to look beyond the departure of its chief negotiator and move forward quickly to clinch a deal with the EU. In a blow to the British government, Davis quit late Sunday, saying he could not support Prime Minister Theresa May’s plan for close trade and regulatory ties with the EU after Brexit next year. His resignation came just two days after May announced she had finally united her quarrelsome government behind a plan for a divorce deal with the EU. Former Brexit Secretary David Davis says he won’t seek to challenge Prime Minister Theresa May’s leadership after resigning from her Cabinet, but that he will pressure her to toughen her position on Britain’s departure from the European Union. But he says they had a difference of strategy and hoped the decision would send a signal to the EU not to push Britain any further in Brexit negotiations. Davis’s late-night resignation undermined May’s already fragile government, which has lost several ministers this year.